The Mediclinics Mediflow is a high performance, high efficiency machine that produces half the noise of its competitors. The Mediclinics Mediflow features ‘Logic Dry’ technology to optimise performance based on ambient conditions and reduce energy consumption. Intelligent management of IR reflection from fixed objects. The IR detection sensor is fully adjustable, from 5 to 20 cm, to allow customising for various settings. 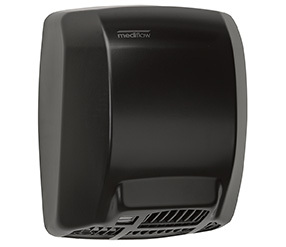 The Mediclinics Mediflow is a high performance, conventional class hand dryer. It is one of the fastest and most energy efficient dryers in its class, and yet, it is still the quietest. The Mediclinics Mediflow produces half the noise of the leading competitors. It is even quieter than machines with far lower performance figures. Three designer finishes make it very versatile – white (steel) and stainless steel (bright and brushed). The stainless steel options are also very attractive and robust. Intelligent monitoring of internal functions optimises component life. 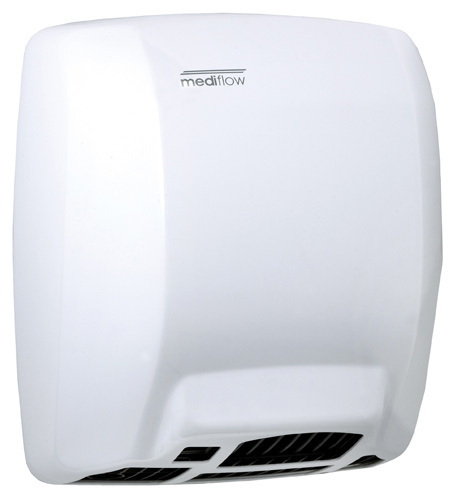 The Mediclinics Mediflow is one of the fastest in its class, utilising high air speed to dry the hands quickly. The Logic Dry technology ensures that heater output is matched to the ambient conditions to dry the hands in the shortest time possible, with the least amount of energy. The Mediclinics Mediflow has advanced vandal-proofing features. Covers are fixed to the base with 2 vandal proof screws, requiring a proprietary wrench to remove. Removal also requires the screws to be turned in a clockwise, rather than the standard, anti-clockwise direction. Casing materials are one-piece, solid, 1.5mm thick steel and stainless steel. The Mediclinics Mediflow is very competitively priced compared to the market leaders. The Mediclinics Mediflow has the best warranty in the country. The Mediclinics Mediflow is a smart, quiet, stylish high-performance machine that can be safely specified for any project. The smooth, modern design will complement a wide range of washroom interiors. The Mediclinics Mediflow is the quietest machine in its class, despite boasting leading performance figures. It produces less than half the noise of the leading competitor. The Mediclinics Mediflow is even more energy efficient than most conventional dryers, thanks to the ‘Logic Dry’ technology. The Mediclinics Mediflow comes in a choice of three finishes; white (steel), bright stainless steel and brushed stainless steel. The Mediclinics Mediflow, above all, is a high quality machine. It is designed and manufactured in Europe to the highest standards, with all components sourced in Europe. Because of this, the Mediclinics Mediflow has the best warranty in its class. The Mediclinics Mediflow is a very easy machine to specify for any project. 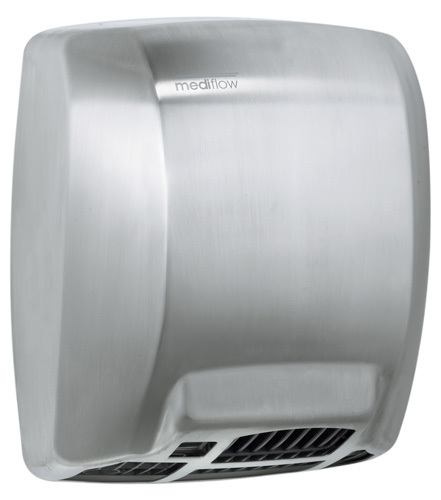 It is a very quiet high-performance hand dryer, with smooth modern styling and a class leading warranty – and it’s very competitively priced. The Mediclinics Mediflow is an intelligent choice.